This is my third Foodie Penpals parcel. This month I was matched with Kim (or Mub) who an ex-pat American from the Netherlands. In Kim’s note she said loved Mexican food. Like me here in North Wales, Kim finds getting all the ingredients she needs challenging sometimes. So she stashes Mexican stuff in her suitcase when she returns from the US. I was lucky that she has shared some of her precious stash with me. She sent me a very helpful handwritten note with recipes and tips how to use the goodies she sent me. Kim sent me two types of cornmeal to make tortillas: some white cornmeal and some blue. After some quick Google research, I established the blue cornmeal is from Blue Corn (aka Hopi Maize) and should have a sweeter & nuttier taste than the white. It’s also a more complete protein. I think some comparative trials are in order here. 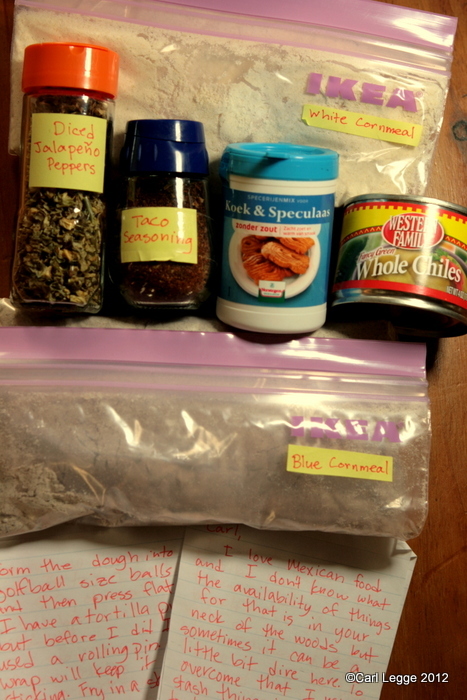 Also included by Kim were some dried jalapeno peppers “to give things a bit of a kick” and some of Kim’s own mix of taco seasoning. A meal is forming itself in my mind to use these ingredients. The aroma of both is very good indeed. Kim included a diddy tin of lovely green chillies which she recommends for chicken enchiladas. Lastly, Kim included a really neat touch of Dutch: some spice mix for making celebration Dutch biscuits called ‘Speculaas’ (I had to look that up too). The seasoning is a mixture of cinnamon, coriander, nutmeg, clove, ginger, cardamom & orange peel: some of my most favourite warm flavours & aromas. Kim suggested it maybe fun if I incorporated the spice in some of my bread making adventures. Good call. Kim said she had to think out of the box on this. Well she succeeded and I have interesting things to play with, so I’m a very happy boy. Thanks so much Kim. I am tempted by the foodie penpals idea now. Off to find out more! What an interesting food parcel to receive. The blue cornmeal sounds particularly fun, but I’m intrigued by the spices too. Have been meaning to make speculaas for a long time, but had no idea they contained so many spices. Hi Carl. I’ve heard of the blue cornmeal flour, you can use it in bread making too – and pies. I have a foodie friend who is married to a Hopi member out in Arizona who uses it. And I’ve just subscribed to the excellent Foodie PenPals scheme. I’d love to join in.